Three intertwined stainless steel posts are fused together, forming the amazing look of the Gotham Dining Table. A truly futuristic modern looking design. Choose between a variety of glass tops to create the finished look that's perfectly matched to your room. Box 1 -- 35lbs | W:16" D:50" H:7"
Star International Bellini Buffet in polished black lacquer. The Bellini is a sleek modern design combining elements of lacquer, glass, and steel. The front sliding motion glass door glides on a solid steel bar across the entire width of the buffet, functioning as a screen over the drawers or open shelf compartment. This makes the design versatile in as much as it can be a buffet or an entertainment center. The open shelf compartment is perfect for storing dinnerware or audio video components. The top of the buffet is matching glass suspended atop four polished steel posts. 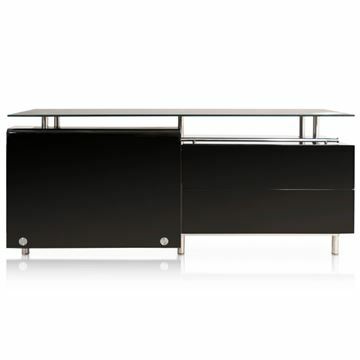 To complete the design, the cabinet rests upon polished steel legs. 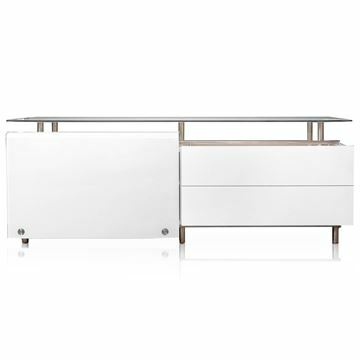 The Bellini Buffet by Star International, a beautiful modern design crafted in polished white lacquer. The Bellini is a sleek modern design combining elements of lacquer, glass, and steel. The front sliding motion glass door glides on a solid steel bar across the entire width of the buffet, functioning as a screen over the drawers or open shelf compartment. This makes the design versatile in as much as it can be a buffet or an entertainment center. The open shelf compartment is perfect for storing dinnerware or audio video components. The top of the buffet is matching glass suspended atop four polished steel posts. To complete the design, the cabinet rests upon polished steel legs. The Conrad Cappuccino Dining Chair, hand crafted in bonded leather. Made by Star International Furniture, the Conrad is a unique modern design with thin tapering legs, and flared sides. 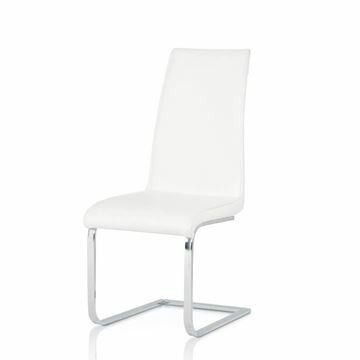 The Conrad Cappuccino Dining Chair, hand crafted in white bonded leather. Made by Star International Furniture, the Conrad is a unique modern design with thin tapering legs, and flared sides. 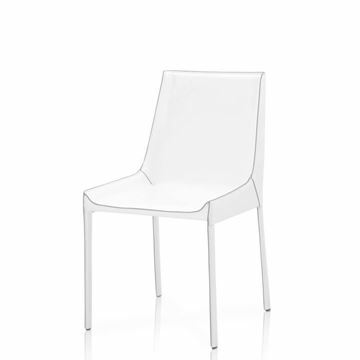 The Milo Dining Chair, in Ecopelle White with polished steel base. 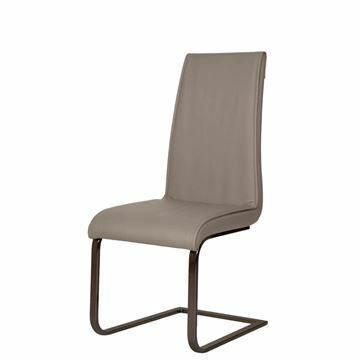 The Milo is a sleek contemporary designed dining chair, offering a comfortable foam padded seat and back rest. Ecopelle is a synthetic leather and is extremely durable and easy to clean. Most any spill simply wipes off using a clean damp cloth, making it an ideal material for every day use. 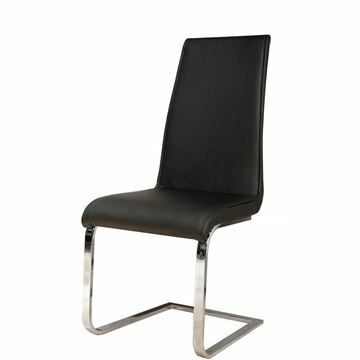 The Milo Dining Chair, in Ecopelle Black with polished steel base. The Milo is a sleek contemporary designed dining chair, offering a comfortable foam padded seat and back rest. Ecopelle is a synthetic leather and is extremely durable and easy to clean. Most any spill simply wipes off using a clean damp cloth, making it an ideal material for every day use. 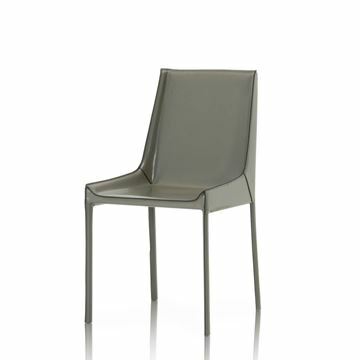 The Milo Dining Chair, in Ecopelle Grey with polished black steel base. The Milo is a sleek contemporary designed dining chair, offering a comfortable foam padded seat and back rest. Ecopelle is a synthetic leather and is extremely durable and easy to clean. Most any spill simply wipes off using a clean damp cloth, making it an ideal material for every day use. The Tobi Dining Chair by Star International Furniture. Crafted in white ecopelle, and polished steel legs. 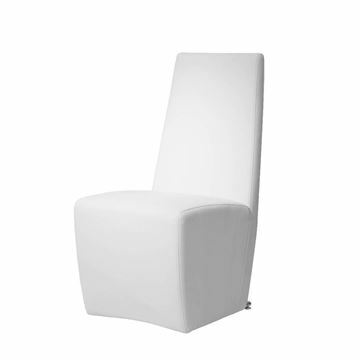 Tobi is a sleek modern design, with a comfortable foam block seat cushion and padded back rest. The Tobi Dining Chair by Star International Furniture. Crafted in graphite ecopelle, and polished steel legs. 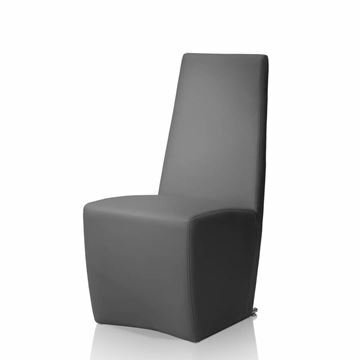 Tobi is a sleek modern design, with a comfortable foam block seat cushion and padded back rest.